Iterable supports a two way integration with Segment: data can flow into Iterable from Segment and vice-versa. This doc covers sending Segment data to Iterable. For an detailed overview on sending Iterable events to Segment, please refer to Adding Iterable as a Segment source. If you are setting up Segment as a data source for your Iterable account for the first time, we recommend creating a new project in Iterable to use as a sandbox. To learn how to set up a project, read Projects overview. 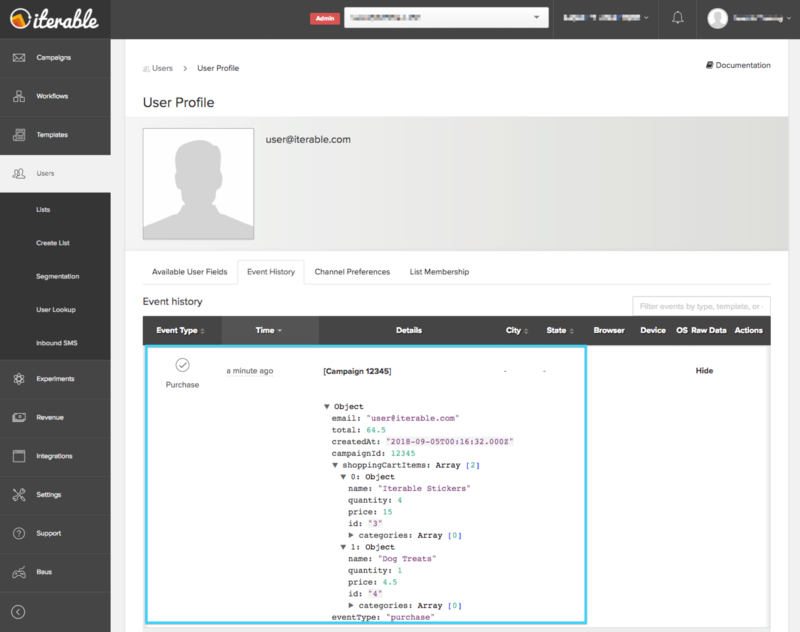 Separates production and development/test user databases. Prevents test events or test fields from updating or casting new data fields in your production project. Makes it possible to iterate on sandbox project data schemes without affecting production campaigns. Now that the connection between Iterable and Segment has been made, you should start seeing data flowing from Segment to Iterable. The remainder of this doc will cover the different ways data can be added to Iterable from Segment, configuration best practice, and troubleshooting. When you call identify with one of Segment's libraries, Segment will call Iterable's /users/update API endpoint to add data for that particular user. All users are keyed by email in Iterable. If you want to use a userId for subsequent identify calls, first call identify with both a userId and email. You can also call identify to update user fields. If you need to update the user's email address in Iterable, you will need to call Iterable's /users/updateEmail API endpoint. Iterable offers the option to either merge user fields with nested data or overwrite them (see the/users/update documentation for more info). By default, this option is set to false. If you wish to disable this, you can pass a destination specific property called mergeNestedObjects and set its value to true. This identify event would merge the mobile property for this user with any other settings that were previously a part of that user's settings field. When you call track with one of Segment's libraries, Segment will call Iterable's /events/track API endpoint and send over the event properties as the data fields in the request. 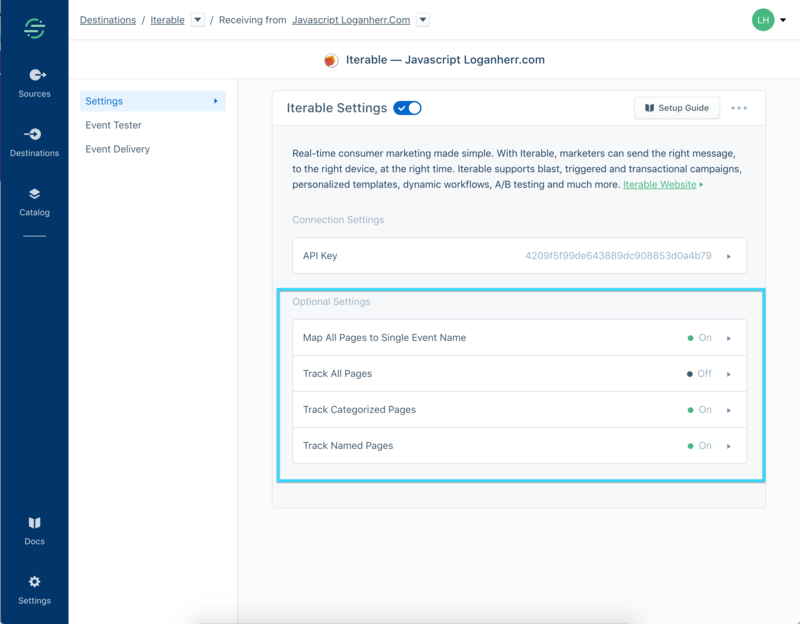 The name of the track event will show up as a custom event in Iterable, and will be available to trigger workflows, segment users, and view analytics. If a user does not already exist in Iterable, calling track for a user event will add that user into the system. You can track with either an email or userId (if a userId exists for that email). First track event call with userId and email; user will be created. Best practice is to supply an email in every track call. If you can be fully confident that a previous identify or track call has already been made with the user's email, then subsequent track calls can just include userId and omit email. Calling page to track pageviews will register as a custom event within Iterable. If you have a page called shoppingCart the custom event will be called shoppingCart page within Iterable. If a user does not already exist in Iterable, calling page for a user event will add that user into the system. Be sure to pass in the email the first time you call page for a user, since Iterable keys users by email. After the first time, you can call page with userId. In Segment's Destinations > Iterable configuration, you can select how you would like page events to be shown in Iterable. When sending a page or screen event, always use the same Iterable event type. The other page-related settings (Track All, Categorized, Named Pages, are still relevant—they determine whether an event will be sent to Iterable at all. Pages will be sent as Loaded a Page. Screens will be sent as Loaded a Screen. We recommend turning this option on. Send an event for every page or screen event. We recommend turning this option off. Send an event for every page or screen with a category. Send an event for every page or screen with a name. Iterable can also be set up as a Segment Source to automatically send email, SMS, and push events to Segment.